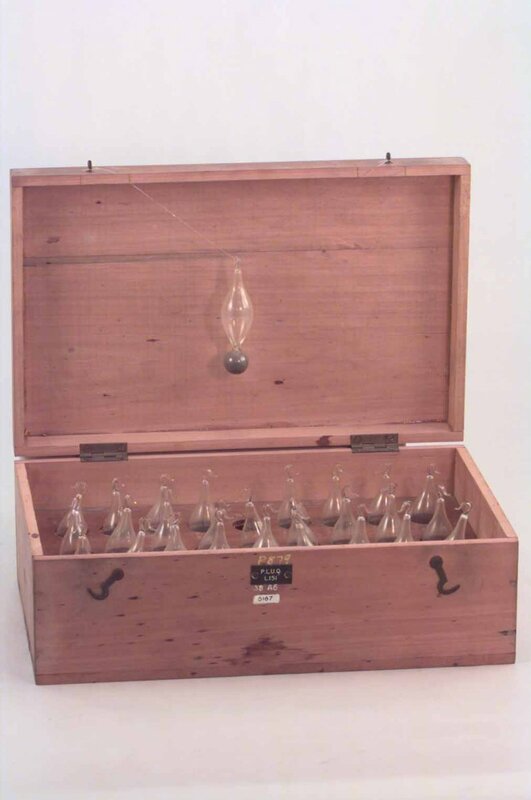 Wooden box containing 27 specific gravity bottles. Sealed pear-shaped glass bottles. Bottles are 2.5 cm in diameter at the widest point and 8.5 cm in length from bulb containing a mercury droplet to the moulded hook at top. Specific gravity bottles used to measure the density of liquids relative to the density of water (Specific gravity H2O = 1). Twenty seven bottles containing finite amount of mercury are graduated by 0.05 divisions from 0.70 to 2.00. The bottles were donated by the X-ray and Radium Laboratory at The University of Queensland , however they were only used there once in ultra-violet light experiments. Gravity bottles can be used to measure the changing effects of temperature on the density of water. Electromagnetic radiation absorbed by water raises the temperature and decreases the density. Bottles suspended by hook with string or wire in water or other liquid will sink or float depending on the relative density of the fluid. For changes in temperature of water due to radiation source several bottles can be floated. The density when each bottle begins to sink can be correlated to the temperature change, a technique going back to Galileo.